Even when the temperatures stay below freezing for a week and we get over half a foot of snow, the pond doesn’t ice over immediately. The wild irises (lower right) had some small sprouts poking out before the snowfall, but I think they’re reconsidering about now. A lot of people turn off their pond in winter. Maybe they redirect the pump out the skimmer, or turn the pump off and rely on air stones to keep some oxygen in the water. We don’t – we let it run all winter long. Part of this (or maybe most) is nothing but laziness – I don’t even want to contemplate blowing all the water out of the pipe running underground from the skimmer pump to the top of the biofalls. Another part is that the pond looks really pretty in the winter, whether the falls are open or iced over. You probably want to live in a place that doesn’t get much colder than Chicago does if you have a small shallow pond. We had a couple of weeks of Minnesota-level temperatures (below 0 F every night and not getting much above 10 F during the day) in February, and the pond started running low and having ice dams. (That nice little stream seen above froze all the way through!) If your typical winter highs are in the 20s, though, the ice won’t get all that thick and will start melting on sunny late-winter days. 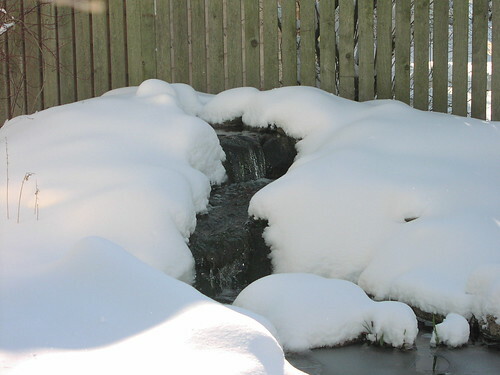 You still need a low-voltage ring de-icer so nitrogen can escape from the pond. You might only use it for a couple of days here and there, but it’s necessary during times when the entire pond freezes over. 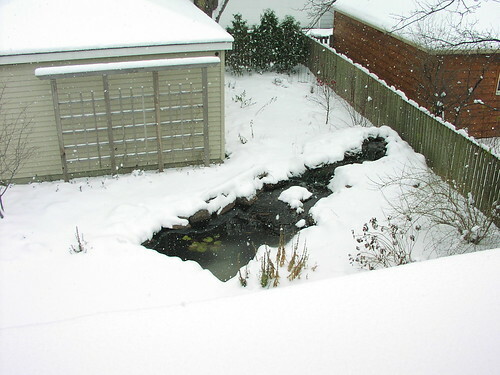 Check on the pond level even during the winter. Dry air means lots of evaporation, and you do need to keep an eye out for ice dams that divert water out of the pond. Your reward? Hordes of animal visitors to your pond, and a lot less work in the fall. We got about 8 inches of snow yesterday. It made for some tricky driving, but it’s way better than the freezing rain we got last week! 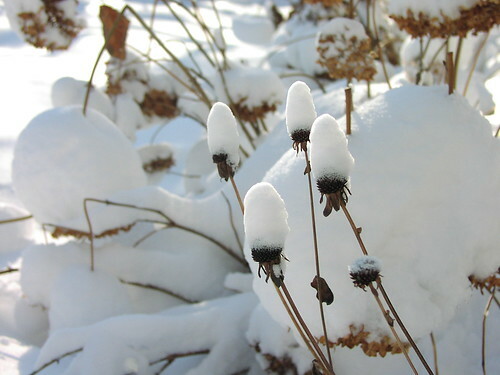 The orange coneflowers are wearing snow hats now, looking quite a bit different than they did in August. 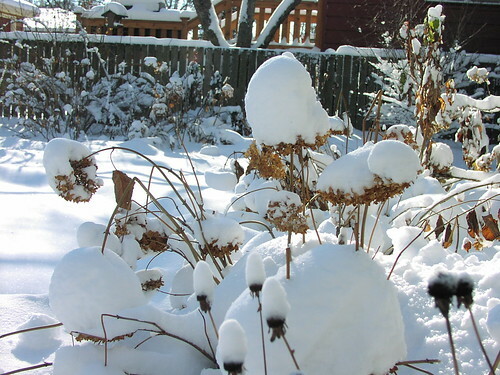 The Annabelle hydrangeas are trying to hold up under this big load of snow, but the ones not standing up straight end up pushed down by the snow and ice. There aren’t many animal tracks in the snow yet, but the resident squirrels and opossums should start venturing to the pond for a drink fairly soon. This weekend marked the first sign that spring will come again. We have reached the earliest sunset of the year–4:20 pm–and will start seeing slightly more light at the end of the day even as the sunrises get later for another month. The reason why the solstice, earliest sunset, and earliest sunrise are spread over a month is due to the Earth approaching perihelion. Because we’re moving faster in our orbit, the local noon is changing quite a bit right now. (Want to know more? A further explanation will involve the dreaded analemma.) You do not see this around the summer solstice: the earliest sunrise and latest sunset are very close to the day of the solstice. I’m happy with even this small sign that warmer, greener days are indeed in the future. This isn’t even the first snowy day of winter – we got a couple of inches of snow on December 1, but it was followed by rain (both freezing and non-freezing) that removed most of it. And it is still coming down now, thanks to a wind coming off of Lake Michigan. I’ve posted the same view from the attic in August and still snowy April.